John Bernacki is our technician in charge of the acrylic department. He has been providing dentures to the profession since 1984. He is fully qualified in denture and orthodontic manufacture. Ask him about full contoured dentures or lingualized occlusion, he's seen it all. Pat Laliberte is the technician in charge of the cast partial department. He has done over 10,000 castings in his career, everything from swing lock partials to distal extension hinges. The design services are always free and our casting are guaranteed for five years. 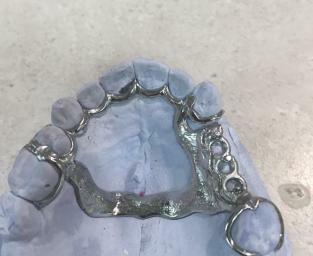 Next time you have a patient that needs new dentures, if their existing dentures are just worn out, try the Reference Denture Technique. 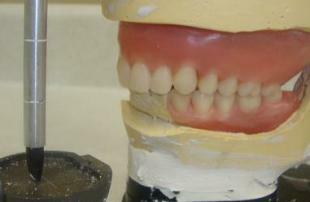 Using the old dentures as custom trays, take a reline impression with them and send them to the lab. The lab will pour and mount the dentures, getting the master models and bite registration in one go, sending the original dentures back the same day. Next, the lab will open the bite (to compensate for the wear on the old dentures), set up the teeth and return it. This eliminates the custom tray and occlusial rim appointment, saving time and money. The patient receives their new denture faster and because the bite was from the old denture, their is less of a "brand new shoe" phase for them to go through. This has the added advantage of the lab getting to see the patient's old denture set up, ensuring a perfect match, first time, every time. We have been using this technique for years and the patient's acceptance has been phenomenal.